$1.6 BILLION SPOTIFY LAWSUIT IS BASED ON A LAW MADE FOR PLAYER PIANOS - "The hidden costs of streaming music." A Field Guide to Streaming Music Services - The Wall Street Journal. A first look at Spotify on the Apple Watch - The Verge. AMARRA - "Breathtaking Sound." Digital Audio for Professionals & Music Enthusiasts. "You’ve never heard such depth, richness and character from your music; rock, blues, classical or hip-hop, doesn’t matter - the same music you’ve listened to for years sounds better with Amarra." Works with your existing iTunes library. Apple Music Is Strong on Design, Weak on Social Networking - The New York Times. Apple Music, Spotify and a Guide to Music Streaming Services - The New York Times. AUDIRVANA - "The Sound of Your Dreams." Audirvana is the creator of high-end audiophile players for the Mac platform, aiming at the best possible sound quality. Comparison of on-demand music streaming services - Wikipedia. Google announces YouTube Music & YouTube Premium - "Goodbye, YouTube Red; hello, new premium services." HOT 100 - Billboard: the week's most popular songs across all genres, ranked by radio airplay audience impressions. How to move your Spotify playlists to Apple Music - The Telegraph. Music Genome Project - was an effort to "capture the essence of music at the fundamental level" using almost 400 attributes to describe songs and a complex mathematical algorithm to organize them. Music streaming on Apple Watch Series 3 is a surprisingly nice feature to have - The Verge. New to Spotify? Follow These Easy Tips to Get Started - Wired. NEXUS Q - "World's first social streaming media player from Google." People are giving up on Apple Music - The Verge. PING - "A social network for music." Set your inner groupie free by following your favorite artists on Ping and friends to discover the music they're talking about, listening to, and downloading. Ping is built into the iTunes app on iPhone and iPod touch. So you can see artist updates from anywhere. Playlist - in its most general form, a playlist is simply a list of songs. They can be played in sequential or shuffled order. SPOTIFY IS OUT OF CONTRACT WITH ALL THREE MAJOR LABELS - AND WANTS TO PAY THEM LESS - Music Business Worldwide. Spotify launches a sleek standalone app for Cadillac vehicle - The Verge. THE BEST MUSIC STREAMING SERVICE - "Popular music streaming services compared." The magic that makes Spotify’s Discover Weekly playlists so damn good - Quartz. Amazon.com MP3 Music Downloads - as of January 5, 2018: 9,319,931 results. Apple Music - since June 30, 2015. Music streaming service by Apple Inc. Users select music on a device, which then plays on the device via Internet streaming. The service also provides music recommendations based on user taste. While Apple Music's cost and music library are similar to other music streaming services, the service aims to distinguish itself with added features and content exclusives. Beats Music - since 2014. "A Music Service With Heart." Subscription-based online music streaming service owned by the Beats Electronics division of Apple, Inc. First developed in 2012 under the name "Daisy", the service combines algorithm-based personalization with expert music suggestions from a variety of sources. The service builds upon Beats' existing consumer electronics line, and its 2012 acquisition of the similar service MOG. The service launched in the United States on January 21, 2014. Deezer - since 2007. Web-based music streaming service. It allows users to listen to music content from record labels including Sony, EMI, Warner Music Group and Universal Music Group on various devices online or offline. EMUSIC - works on any MP3 player. GOOGLE PLAY - gives you one place to find, enjoy, & share Apps, Music, Movies & Books - instantly anywhere across the web & android devices. Google Play is your entertainment hub. Groove - since 2012. (Formerly Xbox Music and Zune Music) is a digital music streaming service developed by Microsoft that offers music streaming through subscription or purchase through the Xbox Music Store. The service is web-based and also available via applications for the Microsoft Windows and Xbox product lines, as well as Android and iOS. The Groove catalog has over 38 million tracks. HYPE MACHINE - since 2005. "Popular MP3 & Music Blog Tracks." ITUNES - "Home to everything that entertains you." Media player and media library application developed by Apple Inc. It is used to play, download, and organize digital audio and video on personal computers running the OS X operating system and the iOS-based iPod, iPhone, and iPad devices, with editions also released for Microsoft Windows. LAST.FM - "Listen to free music and watch videos with the largest music catalogue online." Last.fm is a music discovery service that gives you personalised recommendations based on the music you listen to. MUSIC Key - since 2014. Paid subscription music streaming service operated by Google and marketed by its subsidiary YouTube. The service is an extension of Google's existing Google Play Music All Access service; along with the existing audio-only streaming functionality provided as part of All Access, Music Key adds integration with YouTube to provide advertising-free streaming of music videos hosted by the video hosting service. Music Key launched in a limited beta on November 17, 2014, and will become generally available in 2015. Pandora - "Listen to Free Music You'll Love. At Pandora, we have a single mission: To play only music you'll love. To understand just how we do this, and why we think we do it really, really well, you need to know about the Music Genome Project. Since we started back in 2000, we have been hard at work on the Music Genome Project. It's the most comprehensive analysis of music ever undertaken. With Pandora you can explore this vast trove of music to your heart's content. Just drop the name of one of your favorite songs, artists or genres into Pandora and let the Music Genome Project go." PlayStation Music - since 2015. On-demand streaming music service powered by Spotify. Providing free and premium access to over 30 million tracks, it is available in 41 markets via the PlayStation Network on PlayStation 3, PlayStation 4, Xperia tablet and mobile devices. rara.com - since 2011. Music streaming service offering ad-free, on-demand music streaming from a range of major and independent record labels. RDIO - "Your Music Everywhere. Unlimited access to music from your computer and mobile phone, even when you're offline." REDIGI - "Unlock your digital wealth." The World's First Pre-Owned Digital Marketplace." ReDigi | REcycled DIGItal is a free cloud service that allows you to store, stream, buy, and sell your legally purchased pre-owned digital music. RHAPSODY - "Unlimited Music Anywhere." Music downloads, music videos, lyrics and photos. SOUND CLOUD - "Hear the world’s sounds." SoundCloud is the world’s leading social sound platform where anyone can create sounds and share them everywhere. Recording and uploading sounds to SoundCloud lets people easily share them privately with their friends or publicly to blogs, sites and social networks. It takes just a click to share sounds to Twitter, Tumblr, Facebook and Foursquare. SoundCloud can be accessed anywhere using the official iPhone and Android apps, as well as hundreds of creation and sharing apps built on the SoundCloud platform. SPOTIFY - since 2008. "Music for everyone." Spotify is now free on mobile, tablet and computer. Listen to the right music, wherever you are. Millions of songs on your computer, on your mobile and available offline. Brought to you ad free. Tidal - since 2014. Subscription-based music streaming service that combines lossless audio and high definition music videos with curated editorial. The service has over 25 million tracks and 75,000 music videos. Currently offering no free subscription plans, Tidal claims to pay the highest percentage of royalties to music artists and songwriters within the music streaming market. 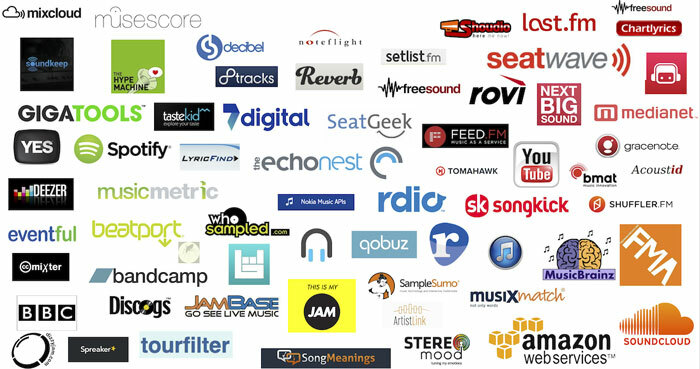 TUNECORE - "The best way to sell your music on iTunes, Amazon, Spotify & more." Digital music distribution. WHYD - "The community of music lovers." Collect and share the best music in the world. WIMP - since 2010. Music streaming service focusing on inspiring users to find new music and old favorites. Through local editorial teams in each country, WiMP provides daily recommendations, tips and playlists for any occasion. The ad-free service is available on computers, mobiles, tablets and network players. WiMP HiFi is now available in Norway, Sweden, Denmark, Germany and Poland. YouTube Music - since 2015. Mobile app developed by YouTube; it provides a tailored version of the service oriented towards music streaming, allowing users to browse through music videos on YouTube based on genres, playlists, and recommendations. The service integrates with the YouTube Red subscription service, which enables ad-free and audio-only background playback.